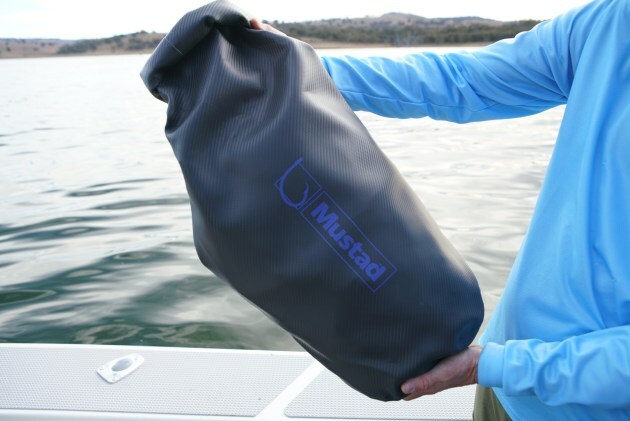 MUSTAD last year released its range of quality tackle and dry bags. The iconic Norwegian hook company has expanded its offering with a range of quality tackle accessories which includes this line up of waterproof backpacks, travel and roll top dry bags. There's also a multi-purpose tackle bag suitable for carrying everything you need for a day on the water. The bags are built using waterproof PVC, and all zippers and clips have been, according to Mustad, tested in the field for durability and long life. I'm a big fan of dry bags. Fishing is a water sport and if you do it often enough, you and your gear will get wet. I'm okay with getting wet, but some of my gear isn't. Camera gear, fishing gear and, on multi day trips, clothing and camping gear, is best kept dry and away from saltwater. This is where a quality dry bag is your best friend. 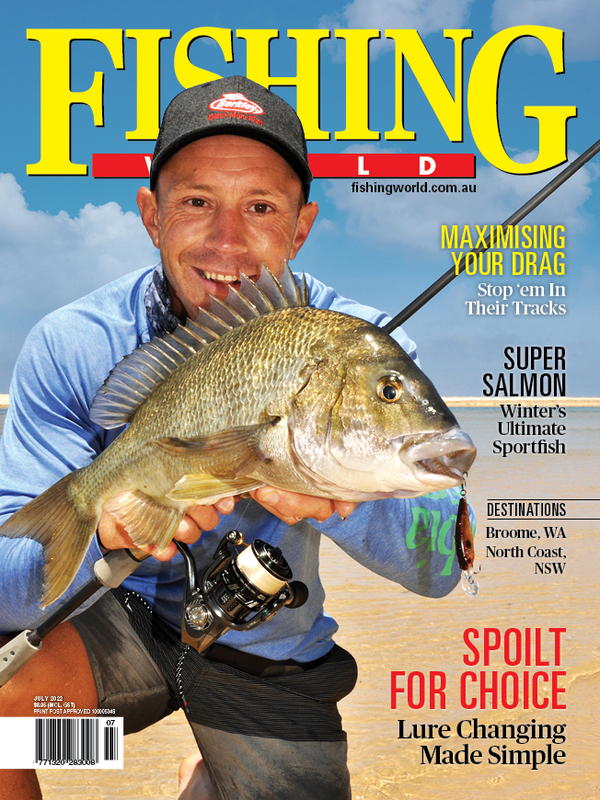 Fishing World has been extensively testing the full range since last year and we're very impressed with the quality and resilience of the gear. The tackle bag has been a mainstay in the Fisho Bar Crusher. I have it loaded with several lure boxes, pliers, braid scissors, leader spools and more. It's a simple bag with no compartments for lure trays, meaning the gear floats around the bag. It's an organised mess, but a good system if you need to cram as much as possible inside your bag. Inside the lid there's a zippered section which fits spools of leader and small items which may get lost within the main compartment. While this bag withstands some spray, it's not a waterproof like the other bags in the range. That said, it has a hard foam base and the top panel drapes over the zipper, making it quite resistant to spray. I give it a hose out every now and then to ensure the zippers keep corrosion free. The tackle bag is also a great size; not so big that it takes up too much floorspace on my boat or others. The duffel bag will keep gear dry if left on the deck of a wet boat or in the rain. The duffel (travel bag) is a great piece of kit from Mustad. I use this as my go-to fishing travel bag. I stuff it with clothes and camping gear and have confidence that all my gear will stay dry if left on the deck of a wet boat or in the rain. This type of bag is useful when travelling to unfamiliar destinations. Having a bullet proof, water resistant bag carrying your gear is very reassuring. Another new bag in the range is the roll top dry bag. Roll tops are your best defence against water. This type of traditional dry bag is great for kayaking and canoeing. I've used it regularly over the past few months in the canoe and kayak to hold camera gear and clothes. The roll top enclosure can be buckled around a fixed point in the canoe or kayak in case of capsize. Alternatively, you can leave some air inside which helps the bag float of it gets dropped overboard. It's a tough bag and has saved my gear from water n several occasions. Roll tops are your best defence against water. Fisho's Patrick Linehan has been putting the 30 L dry bag/backpack through its paces. This backpack features a simple design with a heavy duty zipper top that rolls down to create a dry seal. The backpack also has a small veritcal zipper on the front that allows quick access to a decent sized front pocket, perfect for leader and fishing tools or personal items like phone and wallet. The bag features tough padded shoulder straps and a strong carry handle and is well up to the task of carrying a decent load. After months of use it has kept camera and fishing gear safe and dry on both land and sea - copping plenty of exposure to the elements. 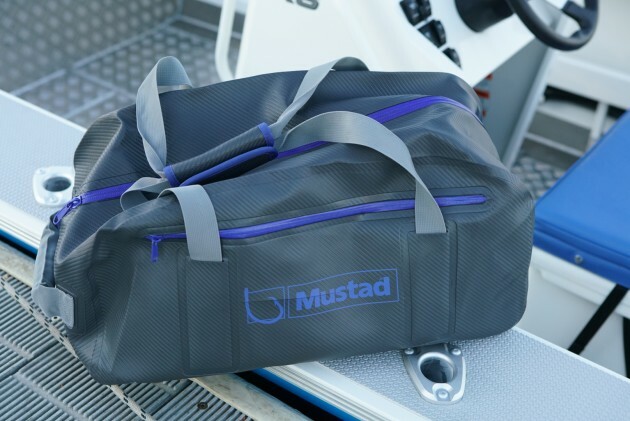 For more info on Mustad's range of bags, click HERE.